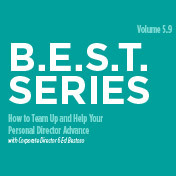 You will learn how to make better approaches, how to find and develop Directors, how to accomplish your goals, and much more. Listen in today to tap into the hearts and minds of the best! How important is the Strategy Session? It’s key to your success! According to Krista Wineinger, strategy sessions build relationships, solidify commitments, and spark momentum. Her step-by-step instructions on holding effective strategy sessions with every new business builder will lead you to growth you’ve never seen before. Never Give Up and Find a Way - Perseverance Pays! Executive Director 6 Courtney Martin delivers a stirring presentation on the power of perseverance when it is strengthened by accountability. She gives a rallying challenge to get in the trenches with your team, and support and encourage them to achieve their goals. Her message highlights how grit, determination, and drive will help you keep your accountability commitments, handle lulls in progress, and achieve your goals. 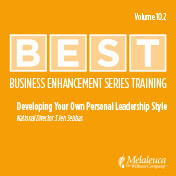 Discover and develop your own unique leadership style! According to National Director 3 Jen Sebbas, each builder’s leadership is as distinctive as a thumbprint. So instead of adopting someone else’s leadership methods, she guides you in pinpointing your own unique strengths so you can most effectively influence your team to maximize their efforts and achieve their goals. Great leaders develop Directors, not followers. Happy shopping experiences create happy customers, and happy customers create residual income! Executive Director 6 Sofia Mariscales shows you how to build a relationship bond with new customers by taking responsibility for their first customer experience. Sharing simple step-by-step instructions on how to educate new customers and help them love shopping with us, Sofia helps you duplicate her highly successful methods in creating customers for life. With warmth and humor, Executive Director 4 Danie Branch shares her effective methods of “finding friends she wants to grow old with” as customers and business partners for life! Discover how going out and doing activities you love is not only fun, but the secret to developing lasting relationships with people you can help. 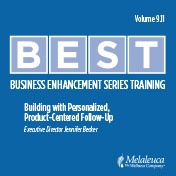 Executive Director Jennifer Becker shares follow-up techniques to raise your customer re-order rate and increase your Product Point average, creating more residual income. Because a Melaleuca business is built on customers and products, creating amazing customer service experiences is central to success. Learn how to treat every customer as your best customer! 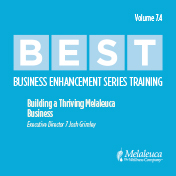 Discover what’s behind Melaleuca’s explosive growth trends and how leaders like you are with the right company at the right time. Jeff shares how Melaleuca offers its business builders strong, steady support and tools for success unequalled by any other business opportunity in the marketplace. 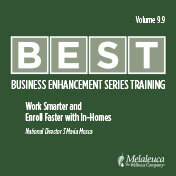 In-homes are one of the most effective ways to enroll new Preferred Members and develop strong Directors. Maria shares practical strategies and best practices for both live and virtual in-homes. 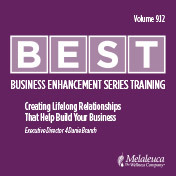 Learn how to accelerate your success and leverage your time with this proven, powerful way to build rock-solid relationships and a strong business. What does it really mean when we say this is a relationship business? Jen shares how trust is the core element of creating customer loyalty and successful business partners. From enrollment to developing Directors, she shares insights and actions that create business building momentum and steady residual income. Melaleuca’s Compensation Plan is rewarding you for developing Directors 2 and 3 like never before. So how do you find Marketing Executives to team up with? And when you find them, how do you get them started off on the right foot? In this audio presentation, Corporate Director 6 Ed Bestoso, who has the largest organization in Melaleuca, teaches how you can ensure every potential business builder gets started right. According to Executive Directors 6 Klinton and Stephanie Keller, the most important thing in helping a new Marketing Executive begin building a successful business is a great Strategy Session. You’ve got to determine their true expectations, and then make the training systematic so they can duplicate it with their own team. That first Strategy Session isn’t about “starting” a business, according to the Kellers, it’s about launching one! Executive Director 6 Kindel Bonin agrees that consistency might not sound exciting, but in her business it is the reason she and her husband are free of credit card debt, living in their dream home, enjoying vacations, and paying cash for their children’s college. If that’s not excitting, what is? Kindel offers five training tips on sustaining consistency to build your business. Join Executive Director 9 Krista Wineinger as she lays out the must-dos of building a business strong enough to last a lifetime—from always presenting a full Melaleuca Overview to holding helpful, inspiring strategy sessions. Krista delivers a wealth of practical, meaningful insights mixed with her usual humor in this engaging presentation. Learn how National Director 9 Brooke Paulin mastered the basics of the Seven Critical Activities to build her business on a solid foundation. By making consistent efforts to actively build her own team of new leaders, she finds she always has leadership ready to keep her team advancing and reaching new heights. In this up-close-and-personal presentation, Executive Director 4 Courtney Martin shares how she has built a robust, healthy business simply by working consistently and always keeping her doors open—even through summer and holiday months where other businesses might slow their pace. As a result, she has a team full of business builders who match her consistent effort and enter every month with full pipelines and plenty of momentum. National Director 3 Beth Schomp knows that building a robust, thriving Melaleuca business with loyal, satisfied customers and committed business partners takes authenticity every step of the way. In this engaging presentation, Beth explains what being authentic means in the context of each Critical Activity—and how your authenticity will result in enrolling more customers and business builders who feel connected to Melaleuca and excited about the opportunities we offer. Using his characteristic wisdom and humor, Corporate Director 3 Mark Atha shares the steps he follows to enroll the next generation of motivated Marketing Executives. He’ll teach you how to identify and approach those with great potential and help them commit even before the Melaleuca Overview begins—and then give them the tools and support they need to start strong and move confidently toward their goals. Executive Director 6 Stacy Bodnar is always looking for new business builders to partner with. But she knows it won’t be just anyone. The people she looks for have traits that all dynamic, successful Melaleuca Marketing Executives possess: they’re passionate about the products, willing to work hard, and hungry to change their circumstances. Learn how Stacy finds these future leaders, and listen to how she piques their interest and gets them excited to meet with her. Stacy’s straightforward, highly duplicable strategy can make a lasting difference in your own efforts to find and mentor strong, passionate new business partners. National Director 9 Heidi Bartolotta shares some of the keys to her own consistent growth from Senior Director to National Director 9—and how you can quickly incorporate them into your own daily activities. She relates how your own personal example is your most powerful leadership tool. And she stresses consistent follow-up, which can help you find new leaders among your customers and give your existing leaders the coaching they need. Heidi’s masterful lesson on leadership is a must-learn for anyone with their sights set on Executive Director. Join Executive Director 9 and 2017 Marketing Director of the Year Krista Wineinger as she shares how to build a business the right way. Krista delves into leading by example—how you can do your daily activities in ways that your team can duplicate. 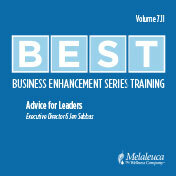 She also reveals how you can conduct more effective Strategy Sessions with your new leaders. Krista’s wealth of insights, delivered with confidence and a healthy dose of humor, will leave you with new ideas and inspiration for building your own business to last a lifetime. Presenting Melaleuca: An Overview is one of the most important activities for any business builder. Whether you prefer to present one-on-one, online, or to a house full of people, National Director Jill Parker has practical advice for anyone who wants to present like a pro. Thanks to its devoted and happy customers, Melaleuca’s EcoSense® line has consistently outperformed sales of its competitors in the ever-evolving green cleaning industry. Why? Join Executive Director 2 Jill Demers as she breaks down the “illusion of choice” customers face in grocery stores and why EcoSense products make the most sense for any customer. You don’t have to be a certified aromatherapist or an expert on essential oils to share their benefits with your friends. Executive Director 4 Molly Pretzlaff provides some practical tips and uses of essential oils to help both Preferred Members and business builders learn the value of following their noses. Melaleuca’s Chief Marketing Officer Scott Hollander lays out the difference between the Peak Performance Pack and its competitors, particularly the Pack’s unique ability to deliver significant results. He goes through each of the supplements included in the Pack, what makes them critical to good health, and how they combine together for an even greater synergistic effect. He also illuminates the profound results of the Freiburg and Sterling studies, and how they show that the Peak Performance Pack is the only supplement on the market to have clinically documented benefits. Executive Director 7 Krista Wineinger shares her advice for overcoming flat spots and building a thriving business. She gives advice on how to approach others, the power of the Strategy Session, and how to focus on the activities that are truly producing income. Krista also trains you on how to find and work with the right partners—people who are ready and willing to change their lives. Krista’s own experience transforming her business and overcoming flat spots makes her advice both practical and effective. Corporate Director 2 and Midwest farmer John Dufner explains what you need to grow your business and make 2017 your best year yet. John says the key to growing any Melaleuca business begins with a good, solid contact list. He gives you advice on how to add names and overcome any fear you might have of approaching potential customers. John’s honest and matter-of-fact training leaves you with a clear direction of what to do next and why it will help you. Executive Director 8 Corey Keller discusses some of the finer points of helping your team advance, in particular the importance of connecting with others on a personal level. Corey says that in order to help someone advance to Director and beyond, you first need to understand them and their needs. After all, how can you help someone reach their goals if you don’t know what they’re working toward? National VP Mark Townsend leads a panel discussion with National Director 4 Yvette Zona, National Director 9 Jason Paulin, and Executive Director 6 Stacy Bodnar to discuss different ideas and tactics involved in presenting a Melaleuca Overview. While the bare bones of every Overview is the same, everyone has their own approach and every audience has different needs, so it is important to learn how to tailor your approach accordingly. There are seven Critical Business-Building Activities, and as Senior Director 7 Jennifer Becker will tell you, there’s a reason why “Keep Building Your Contact List” is number one. Jennifer explains how to keep and build an organized contact list, how to make a game plan to contact each person on that list, and why it’s important to stay in touch with everybody regardless of whether they become customers or not. Would you recommend a car to your friend that you’ve never driven? Or a movie that you’ve only seen the trailer for? You probably would not. So how are you going to build a Melaleuca business if you haven’t tried the products? Corporate Director 9 Ed Bestoso discusses the many reasons why you should buy a Home Conversion Pack—and all of your enrollees should too. Ed explains that there is no better way to save money and fall in love with all of Melaleuca’s most popular products right away. Sometimes when your business isn’t advancing, you might discover that it’s not because of your fear to do the work, but your fear to lead others. Executive Director 6 Jen Sebbas describes the great advice she got from one of her personal enrollees that made her realize she needed to change her mindset, and how she used that great advice to help another enrollee who had not advanced beyond Director status for more than three years. The fear of failure can be crippling. It can take smart, capable people full of potential and stop them in their tracks. This fear isn’t just for new people starting a Melaleuca business; it can happen to anyone. Executive Director 6 Irma Mospan describes how her business went flat and her contact list ran dry until CEO Frank VanderSloot invited her to the QUEST Challenge. Irma had to reconnect with Melaleuca’s mission statement and make hard decisions about whether or not her road to success was over or just beginning. Set the right tone at an initial approach and be prepared for success. With helpful anecdotes from her own learning experiences, National Director 9 Brooke Paulin shares how to show confidence in every approach and move your business forward by owning what you do. Are you focusing on the activities that will help your business grow? National Director Maria Mosca breaks down how you can work smarter instead of harder, maximize your efforts, and see bigger results by consistently adhering to income-producing activities. Maria’s insight will help you add to your contact list, finesse your approaches, and host effective in-homes to help your business flourish. When you can help your personal directors advance to Directors 3, it’s a game changer. Drawing on universal principles of success and patterns of human psychology, National Director 6 Dave Crescenzo maps out the simple steps to take that will inspire independent leadership within your Directors. Strategy Sessions are an opportunity to get new enrollees on the right track with the right tools and the belief they need to actualize their goals. In this training, National Director 7 Jason Paulin gives insightful advice along with memorable examples about how to increase the effectiveness of your strategy sessions and help new business builders experience success faster. Your contact list is more than a list of names. In this audio training, National Director 9 Heidi Bartolotta encourages you to shift the way you think about your contact list, reminding us that behind every name is a life that we can impact with Melaleuca. Changing your perspective on your contact list can make a world of difference in adding names, having more meaningful approaches, and enhancing lives as you build a flourishing business. To build a thriving business, you need to be a leader who knows the way, shows the way, and goes the way. As Marketing Executives advance in their Melaleuca business, many of them shift their energy away from personal activity and focus more on managing their team, which inhibits them from becoming leaders who walk the talk. Executive Director 7 Josh Grimley gives valuable insight on how continuous personal activity will transform you into the leader your team truly needs, helping your business thrive and grow faster than ever. Success is a beautiful thing. But what happens when you reach your goals? Where do you see your Melaleuca business in five years? Or ten? In this special two-part training session, National Director 2 MaryJo Tolliver and Executive Director 9 Maria Mosca describe how your continued success depends on you stepping out of your comfort zone and rediscovering your passion. Empowering people empowers yourself. There are many steps and different strategies people use to become successful Melaleuca business leaders, but there are two that everyone must learn: how to add people to your contact list and how to approach them. Without a firm grasp of these two steps, everything else falls apart. That’s why Executive Director 8 Corey Keller focuses on these concepts to help business leaders like you find success. Give your business a firm foundation to stand on. 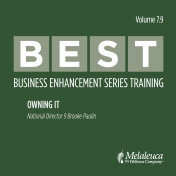 So you are building a Melaleuca business, but do you have ownership over yourself and what you do? To be an effective leader, it is critical to find your identity and define who you are. National Director 5 Brooke Paulin will help you think more deeply about who you are and how the language you use to introduce yourself to potential customers can have a profound effect on perception and the success of your Melaleuca business. *The B.E.S.T. Series are US training with content that may not apply to the European market. is strictly prohibited and can lead to legal consequences in case of disregard.